Jonathan Barnhoorn is the main author of the QRTEngine paper and has been involved as the resident CSS expert from the start. 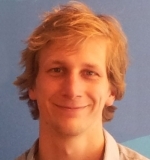 Jonathan is a PhD student at the University of Twente on the topic of motor learning in elderly. He holds a MSc (research) in cognitive neuroscience, a BSc in psychology and a BSc in communication & multimedia design. Jonathan is particularly interested in the intersection of technology and human behavior, ranging from usability research to brain-computer interfaces. How can I make an IAT for Qualtrix?